This is the second book by Sandra Bricker I've read recently, the first being Love Finds You in Holiday, Florida. While they are both fun reads unfortunately they are very similar stories. I do think I liked this one a bit more just because the characters were more real to me. You can't really see the belly... but this is my 7 1/2 months pregnant self sitting in the hall closet washing everything with vinegar water. Still got the musty smell though... hoping that all the friends who say it will eventually go away are right! Elyse McCord always plays it safe─a fact she blames on being the biological daughter of a modern-day Bonnie and Clyde. Even in the security of her adoptive family the McCords, the timid dog whisperer keeps her guard up with strangers. But when she discovers a dog being horribly mistreated, shy Elyse transforms into a mighty warrior and charges into a perilous situation, not only risking her life but also her heart. Reporter Andrew Stone has been fearless since the day his wife was shot and killed three years ago. He has one mission─use his Texas Ranger upbringing to find her murderer and clear his own name of any involvement. When he sees a beautiful brunette in the hands of a pistol-welding maniac, he’s forced to abandon his covert surveillance and go to the rescue. The danger surrounding Andrew doesn’t scare him at all, but the awakening of his dormant heart terrifies him. This is the second in the McChord Sisters series and I think it really wouldn't work as well as a stand alone since the first sister is a prominent story thread in this book as well. That said, I enjoyed going back to this family to read about another sibling. There is definitely an element of suspense in this book and quite a twist at the end. The romance part of the story is fairly predictable though. 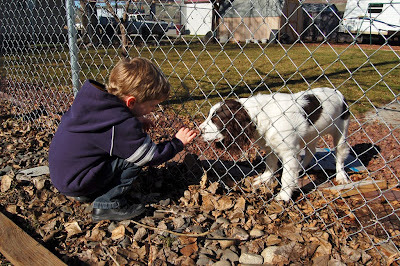 This is the 5 month old Springer puppy that lives next door named Max. They run up and down together on their respective sides of the fence... Good times ahead! 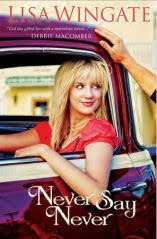 In February of 2009, Love Finds You in Last Chance, California was published by Summerside Press. Finding Jeena will release in April 2010 from Kregel Publications. Miralee Ferrell lives in Washington with Allen, her husband of more than 37 years, ans has two grown children. 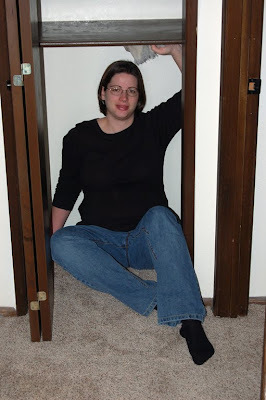 She serves on staff at her local church and is actively involved in ministry to women. I really enjoyed this book. With no internet to distract me I read the whole thing in one day. At first it's hard to see how all the different characters will relate, but they weave into a whole eventually. Also, living near this part of the country makes it easier for me to picture the story happening. I love that the author included an introduction and a post script explaining some history surrounding the setting and that she used some real historical figures in her story. The story itself has enough mystery and intrigue to keep you guessing til the end. And while I originally thought I knew how it would end, I changed my mind half way through. I like forming opinions about characters and watching them change! 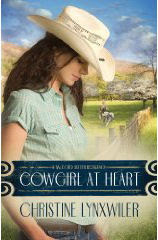 This is a great title in the Love Finds You series! 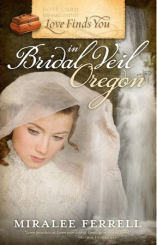 If you would like to read the first chapter of Love Finds You in Bridal Veil, Oregon, goHERE. You would think that with two weeks of no internet I'd have accomplished all sorts of things in my new house... You'd be wrong! I think I have cleaned more in the last two weeks than I did in the last year! Partly thanks to no sill leading under the door out to the new laundry room and contractors tracking stuff. Partly due to the nasty musty smell that's still hanging around (we've tried the vinegar and now are to replacing the baseboard heaters). Not to mention that I'm over 7 months pregnant and about my son's naptime I'm just completely out of energy. All that to say... the kitchen is organized, we can sit nicely in the living room, Cory can play in his room, and our bedroom only has a few small things that need attention. And I do still have at least a month (hopefully!) until baby arrives to get the spare room in order so he has room for the port-a-crib! But, my sewing machine is still in it's box. Be sure to enter the Double Trouble Prize Package Giveaway by clicking on the ‘Double the Sass” button! Susan’s giving away an iPod prize package that is anything but troubling! Check it out! Instead of a Wordless Wednesday post today I'd like to bring you a short PSA (public service announcement). Today is Global Food Crisis Day. What does that mean? It's a day to stop and think about those in the world who are in crisis because they don't have enough food to eat. It's a time to stop and think about what we can do to alleviate their suffering. Because of the global economy more people than ever are suffering with not enough to eat. Compassion International is committed to helping as many of these people, especially children, as they can. Right now their Global Food Crisis Fund is being directed to help those in the aftermath of the earthquake in Haiti. You can be assured that Compassion will use your donation to serve as many people as possible. Over 80% (and this is high for charity organizations) of all donated money goes directly to help children and families and they have received the highest awards for charity standards. Also, because Compassion already had a presence in Haiti before the earthquake they have people there who know the area and the people of Haiti know they can be trusted. I have been a partner with Compassion for the past 14 years and have always been impressed with the work they do. Thanks for considering those in the world who are less fortunate than we are. Here I am, stealing my best friend's internet... We just found out that we won't get our fiber internet installed for "a month or two" because they are waiting on the ground to thaw. Which is ironic because the same PUD is installing new power poles just half a mile from our house and I know they're digging deeper for that than they would have to for the fiber line! Anyway, we'll be getting dial-up internet in the mean time so I can at least be partially connected to the world! Just don't expect too many pictures for awhile! 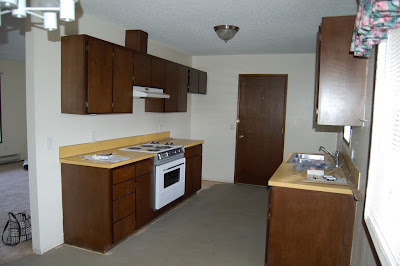 We got our new stove installed on Friday/Saturday and in the process discovered that 2 layers down on the linoleum was this fabulous 70's green layer that had a ton of texturing. Why anyone thought that would be a good idea in the kitchen... I'm just glad I didn't have to keep it clean! And, after moving all day Saturday we were unpacking and decided to stop at midnight. Then couldn't find the sheets for our bed! After opening literally every single box in the house we found them in the bedroom behind some large pictures stacked against the wall. Of course, right where they should have been! So far the trains aren't bothering me too bad at night although they do whistle quite loudly. However, they wake Cory up quite a bit and then he calls out, "Mama, train!" which always wakes me up! Between that and the neighbor's heating unit that makes an ungodly squawk every time it kicks on I will be so thankful when we get our new windows this spring/summer! Lisa lives in central Texas were she is a popular inspirational speaker, magazine columnist, and national bestselling author of several books. 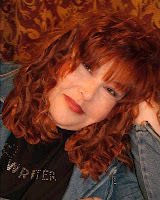 Her novel, Tending Roses, received dozens of five-star reviews, sold out thirteen printings for New York publisher, Penguin Putnam, and went on to become a national bestselling book. Tending Roses was a selection of the Readers Club of America, and is currently in its fourteenth printing. 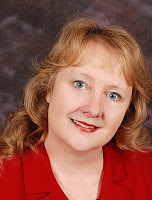 Lisa is now working on a new set of small-town Texas novels for Bethany House Publishers. 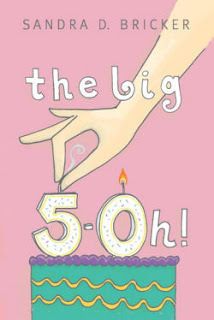 The series debuted with Talk of the Town and continued with Word Gets Around and Never Say Never. A new series is also underway for Penguin Group NAL, beginning with A Month of Summer (July 2008), and continuing with The Summer Kitchen (July 2009) and Beyond Summer (July 2010). 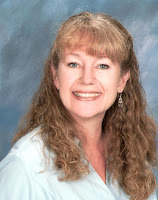 Lisa's works have been featured by the National Reader's Club of America, AOL Book Pics, Doubleday Book Club, the Literary Guild, American Profiles and have been chosen for the LORIES best Published Fiction Award. In 2009, A Month of Summer was nominated for the American Christian Fiction Writers Book of the Year award. Well, considering we've just moved I've only gotten a few chapters into this one. I did read the book that came before it and it was a fun, but mostly light read. I would say this is probably a stand alone book as Kai is an entirely new character, but it uses the same supporting cast as previous books about Daily, Texas. The story is told in alternating chapters by Kai and Donetta. She figures more prominently than the book description shows. These pictures were taken 2 weeks ago, right in the middle of getting the new vinyl on the floor (which wasn't actually necessary as all the repairs were under the sink, but hey, we didn't have to pay for it and I got to pick it out, score!). No, the curtains are not mine and yes, they are going away ASAP! 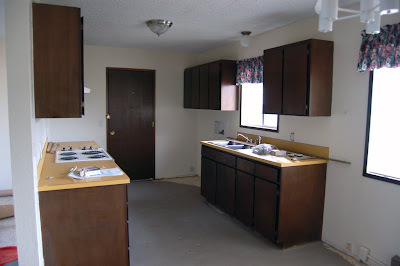 At the far ends of each counter top are going the fridge (left) and on the right is where the washer/dryer hookups were. We are building a laundry room out the door in the garage. Hooray! Then eventually we will get a dishwasher next to the sink and a whole bunch more counter space!!! Oh, and did you notice the old old stove? That's going away too, especially with knobs on the front at kid height. And one burner that doesn't ever turn off except by the breaker... fun times! Living room is to the left where you see my black and white purse. 3 bedrooms and a bathroom are "behind" me. 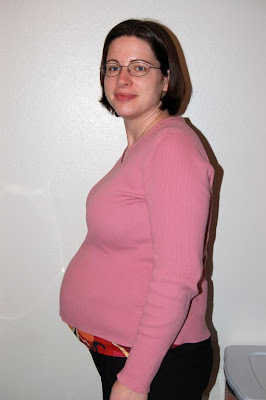 Please excuse the fact that this picture was taken 2 days before 31 weeks... horror, I know! But considering I'll be living without internet for who knows how long I wanted to get this up! Definitely sticking out a lot more this month although it doesn't seem to be slowing me down too much. The only problem now is that it seems every time I go to bend over I get a Braxton Hicks contraction and my stomach gets so hard I literally can't bend at all. Kind of annoying! The little guy is still kicking up a storm although I think he's a bit more confined now. The midwife said he was head down at the last appointment so let's hope he stays that way! 2 months to go and I'll be plenty busy getting our new house in order!